It is an very simple emoji share tools. you can share the HD emojis picture with your friend by Facebook/Twitter. - Share HD emoji with friend. - Support too much apps. - Very simple to use and powerful. 1. 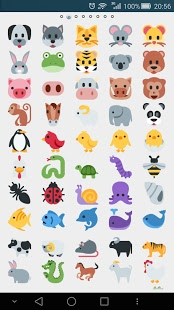 How to share an emoji in "Emoji Share" app? a. Open the "Emoji Share". b. Click the relative emoji icon. c. Select the app that you want to share emoji. 2. How to share an emoji? a. Click the "Galley" or "Pictures" in the app. b. Select the "Emoji Share" to select an emoji. c. Click one emoji, then back to your app. 3. 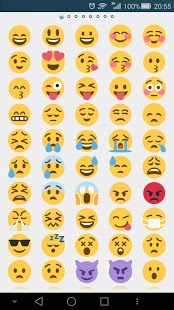 Can I input emoji by this app? Sorry, you can't input emoji by this app, you can only share emoji picture with your friend. if you need to input emoji, you can install an Emoji Keyboard app.